Operation Torch (8–16 November 1942) was an Anglo–American invasion of French North Africa during the Second World War. It was aimed at reducing pressure on Allied forces in Egypt, and enabling an invasion of Southern Europe. It also provided the ‘second front’ which the Soviet Union had been requesting since it was invaded by the Germans in 1941. The region was dominated by the Vichy French, officially in collaboration with Germany, but with mixed loyalties, and reports indicated that they might support the Allied initiative. The American General Dwight D. Eisenhower, commanding the operation, planned a three-pronged attack, aimed at Casablanca (Western), Oran (Center) and Algiers (Eastern), in advance of a rapid move on Tunis. The Western Task Force encountered unexpected resistance, as well as bad weather, but Casablanca, the principal French Atlantic naval base, was captured after a short siege. The Center Task Force suffered some damage to its fleet, trying to land in shallow water, but the enemy ships were sunk or driven off, and Oran surrendered after heavy fire from British battleships. The Eastern Task Force met less opposition because the French Resistance had staged a coup in Algiers, and the Allies were able to push inland and compel surrender on the first day. The success of Torch caused the commander of French forces in the region, Admiral Darlan, to order full co-operation with the Allies, in return for being retained as High Commissioner, with many Vichy officials keeping their jobs. But Darlan was assassinated soon after, and De Gaulle’s Free French gradually came to dominate the government. Operation Torch was the first mass involvement of US troops in the European–North African Theatre, and saw the first major airborne assault carried out anywhere by the United States. The Allies planned an Anglo-American invasion of north-western Africa/Maghreb—Morocco, Algeria and Tunisia, territory nominally in the hands of the Vichy French government. With British forces advancing from Egypt, this would eventually allow the Allies to carry out a pincer operation against Axis forces in North Africa. The Vichy French had around 125,000 soldiers in the territories as well as coastal artillery, 210 operational but out-of-date tanks and about 500 aircraft, half of which were Dewoitine D.520 fighters—equal to many British and U.S. fighters. These forces included 60,000 troops in Morocco, 15,000 in Tunisia, and 50,000 in Algeria, with coastal artillery, and a small number of tanks and aircraft. In addition, there were 10 or so warships and 11 submarines at Casablanca. The Allies believed that the Vichy French forces would not fight, partly because of information supplied by American Consul Robert Daniel Murphy in Algiers. The French were former members of the Allies and the American troops were instructed not to fire unless they were fired upon. However, they harbored suspicions that the Vichy French navy would bear a grudge over the British attack on Mers-el-Kebir in 1940. An assessment of the sympathies of the French forces in North Africa was essential, and plans were made to secure their cooperation, rather than resistance. German support for the Vichy French came in the shape of air support. Several Luftwaffe bomber wings undertook anti-shipping strikes against Allied ports in Algiers and along the North African coast. Senior US commanders remained strongly opposed to the landings and after the western Allied Combined Chiefs of Staff (CCS) met in Washington on 30 July, General George Marshall and Admiral Ernest King declined to approve the plan. U.S. President Franklin D. Roosevelt gave a direct order that Torch was to have precedence over other operations and was to take place at the earliest possible date, one of only two direct orders he gave to military commanders during the war. Planners identified Oran, Algiers and Casablanca as key targets. Ideally there would also be a landing at Tunis to secure Tunisia and facilitate the rapid interdiction of supplies travelling via Tripoli to Rommel's forces in Libya. However, Tunis was much too close to the Axis airfields in Sicily and Sardinia for any hope of success. A compromise would be to land at Bône (Annaba) in eastern Algeria, some 300 miles (480 km) closer to Tunis than Algiers. 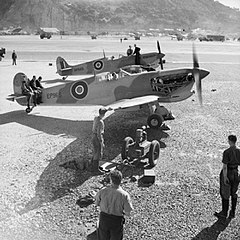 Limited resources dictated that the Allies could only make three landings and Eisenhower — who believed that any plan must include landings at Oran and Algiers — had two main options: either the western option, to land at Casablanca, Oran and Algiers and then make as rapid a move as possible to Tunis some 500 miles (800 km) east of Algiers once the Vichy opposition was suppressed; or the eastern option, to land at Oran, Algiers and Bône and then advance overland to Casablanca some 500 miles (800 km) west of Oran. He favoured the eastern option because of the advantages it gave to an early capture of Tunis and also because the Atlantic swells off Casablanca presented considerably greater risks to an amphibious landing there than would be encountered in the Mediterranean. The Combined Chiefs of Staff, however, were concerned that should Operation Torch precipitate Spain to abandon neutrality and join the Axis, the Straits of Gibraltar could be closed cutting the entire Allied force's lines of communication. They therefore chose the Casablanca option as the less risky since the forces in Algeria and Tunisia could be supplied overland from Casablanca (albeit with considerable difficulty) in the event of closure of the straits. Marshall’s opposition to Torch delayed the landings by almost a month, and his opposition to landings in Algeria led British military leaders to question his strategic ability; the Royal Navy controlled the Strait of Gibraltar, and Spain was unlikely to intervene as Franco was hedging his bets. The Morocco landings ruled out the early occupation of Tunisia. Eisenhower told Patton that the past six weeks were the most trying of his life. In Eisenhower's acceptance of landings in Algeria and Morocco, he pointed out that the decision removed the early capture of Tunis from the probable to only the remotely possible because of the extra time it would afford the Axis to move forces into Tunisia. In July 1941, Mieczysław Słowikowski (using the codename "Rygor"—Polish for "Rigor") set up "Agency Africa", one of the Second World War's most successful intelligence organizations. His Polish allies in these endeavors included Lt. Col. Gwido Langer and Major Maksymilian Ciężki. The information gathered by the Agency was used by the Americans and British in planning the amphibious November 1942 Operation Torch landings in North Africa. These officers were willing to support the Allies but asked for a clandestine conference with a senior Allied General in Algeria. Major General Mark W. Clark—one of Eisenhower's senior commanders—was dispatched to Cherchell in Algeria aboard the British submarine HMS Seraph and met with these Vichy French officers on 21 October 1942. The Allies organised three amphibious task forces to simultaneously seize the key ports and airports in Morocco and Algeria, targeting Casablanca, Oran and Algiers. Successful completion of these operations was to be followed by an eastwards advance into Tunisia. A Western Task Force (aimed at Casablanca) was composed of American units, with Major General George S. Patton in command and Rear Admiral Henry Kent Hewitt heading the naval operations. This Western Task Force consisted of the U.S. 2nd Armored Division and the U.S. 3rd and 9th Infantry Divisions—35,000 troops in a convoy of over 100 ships. They were transported directly from the United States in the first of a new series of UG convoys providing logistic support for the North African campaign. U-boats, operating in the eastern Atlantic area crossed by the invasion convoys, had been drawn away to attack trade convoy SL 125. At Safi, the objective being capturing the port facilities to land the Western Task Force's medium tanks, the landings were mostly successful. The landings were begun without covering fire, in the hope that the French would not resist at all. However, once French coastal batteries opened fire, Allied warships returned fire. By the time General Ernest Harmon's 2nd Armored Division arrived, French snipers had pinned the assault troops (most of whom were in combat for the first time) on Safi's beaches. Most of the landings occurred behind schedule. Carrier aircraft destroyed a French truck convoy bringing reinforcements to the beach defenses. Safi surrendered on the afternoon of 8 November. By 10 November, the remaining defenders were pinned down, and the bulk of Harmon's forces raced to join the siege of Casablanca. Casablanca was the principal French Atlantic naval base after German occupation of the European coast. The Naval Battle of Casablanca resulted from a sortie of French cruisers, destroyers, and submarines opposing the landings. A cruiser, six destroyers, and six submarines were destroyed by American gunfire and aircraft. The incomplete French battleship Jean Bart—which was docked and immobile—fired on the landing force with her one working gun turret until disabled by the 16-inch calibre American naval gunfire of USS Massachusetts, the first such heavy-calibre shells fired by the U.S. Navy anywhere in World War II. Two U.S. destroyers were damaged. The Center Task Force was split between three beaches, two west of Oran and one east. Landings at the westernmost beach were delayed because of a French convoy which appeared while the minesweepers were clearing a path. Some delay and confusion, and damage to landing ships, was caused by the unexpected shallowness of water and sandbars; although periscope observations had been carried out, no reconnaissance parties had landed on the beaches to determine the local maritime conditions. This helped inform subsequent amphibious assaults—such as Operation Overlord—in which considerable weight was given to pre-invasion reconnaissance. The U.S. 1st Ranger Battalion landed east of Oran and quickly captured the shore battery at Arzew. An attempt was made to land U.S. infantry at the harbour directly, in order to quickly prevent destruction of the port facilities and scuttling of ships. The operation—code named Operation Reservist—failed, as the two Banff-class sloops were destroyed by crossfire from the French vessels there. The Vichy French naval fleet broke from the harbor and attacked the Allied invasion fleet, but its ships were all sunk or driven ashore. As agreed at Cherchell, in the early hours of 8 November, 400 mainly Jewish French Resistance fighters staged a coup in the city of Algiers. Starting at midnight, the force under the command of Henri d'Astier de la Vigerie and José Aboulker seized key targets, including the telephone exchange, radio station, governor's house and the headquarters of 19th Corps. On 8 November 1942, the invasion commenced with landings split between three beaches—two west of Algiers and one east. Under overall command of Major General Charles W. Ryder, Commanding General of the U.S. 34th Infantry Division, British 11th Brigade Group from the British 78th Infantry Division, landed on the right hand beach, U.S. 168th Regimental Combat Team, from the 34th Infantry Division, supported by 6th Commando and most of 1st Commando on the middle beach while the U.S. 39th Regimental Combat Team, also from the U.S. 34th Division, supported by the remaining 5 troops from 1st Commando landed on the left hand beach. The British 36th Brigade Group from the British 78th Division stood by in floating reserve. Though some landings went to the wrong beaches, this was immaterial because of the extremely low level of French opposition. All the coastal batteries had been neutralized by French resistance, and one French commander openly welcomed the landing Allies. The only fighting took place in the port of Algiers, where in Operation Terminal, two British destroyers attempted to land a party of U.S. Army Rangers directly onto the dock, in order to prevent the French destroying the port facilities and scuttling their ships. Heavy artillery fire prevented one destroyer from landing, but the other was able to disembark 250 Rangers before it too was driven back to sea. The landed troops pushed quickly inland and General Juin surrendered the city to the Allies at 18:00. Giraud succeeded Darlan but like him replaced few of the Vichy officials. He even ordered the arrest of the leaders of the Algiers coup of 8 November, with no opposition from Murphy. The French North African government gradually became active in the Allied war effort. The limited French troops in Tunisia did not resist German troops arriving by air; Admiral Esteva, the commander there, obeyed orders to that effect from Vichy. The Germans took the airfields there and brought in more troops. The French troops withdrew to the west, and within a few days began to skirmish against the Germans, encouraged by small American and British detachments who had reached the area. While this was of minimal military effect, it committed the French to the Allied side. Later all French forces were withdrawn from action to be properly re-equipped by the Allies. Giraud supported this but also preferred to maintain the old Vichy administration in North Africa. Under pressure from the Allies and from de Gaulle's supporters, the French régime shifted, with Vichy officials gradually replaced, and its more offensive decrees rescinded. In June 1943, Giraud and de Gaulle agreed to form the "Comité français de Libération nationale" (CFLN), with members from both the North African government and from de Gaulle's "French National Committee". In November 1943, de Gaulle became head of the CFLN, and de jure head of government of France, recognized by the U.S. and Britain. In another political outcome of Torch (and at Darlan's orders), the previously Vichyite government of French West Africa joined the Allies. One of the terms of the Second Armistice at Compiègne agreed to by the Germans was that southern France would remain free of German occupation and self-governed from Vichy. The lack of determined resistance by the Vichy French to the Allied invasions of North Africa and the new de Gaulle policies in North Africa convinced the Germans that France could not be trusted. Moreover, the Anglo-American presence in French North Africa invalidated the only real rationale for not occupying the whole of Metropolitan France—it was the only practical means to deny the Allies use of the French colonies. The Germans and Italians immediately occupied southern France and German troops moved to seize the French fleet in the port of Toulon, beginning on 10 November. 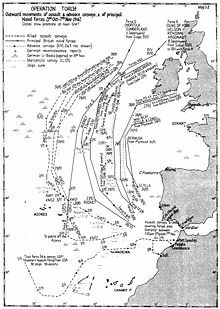 The naval strength of the Axis in the Mediterranean would have been greatly increased if the Germans had succeeded in seizing the French ships, but every important ship was scuttled at dock by the French Navy before the Germans could take them. The British Eighth Army in the east—commanded by Lieutenant-General Bernard Montgomery—stopped around Tripoli to allow reinforcements to arrive and build up the Allied advantage and to repair the port there. In the west, the forces of the First Army came under attack at the end of January, being forced back from the Faïd Pass and then suffering a reversal at Sidi Bou Zid on 14–15 February. Axis forces pushed on to Sbeitla and then to the Kasserine Pass on 19 February, where the U.S. II Corps retreated in disarray until heavy Allied reinforcements halted the Axis advance on 22 February. Fredendall was replaced by George Patton. General Sir Harold Alexander arrived in Tunisia in late February to take charge of the new 18th Army Group headquarters, which had been created to take overall control of both the Eighth Army and the Allied forces already fighting in Tunisia. The Axis forces again attacked eastward at Medenine on 6 March but were easily repulsed by the Eighth Army. Rommel counselled Hitler to allow a full retreat to a defensible line but was denied, and, on 9 March, Rommel left Tunisia to be replaced by Jürgen von Arnim, who had to spread his forces over 100 miles (160 km) of northern Tunisia. Despite Operation Torch's role in the war and logistical success, it has been largely overlooked in many popular histories of the war and in general cultural influence. The Economist speculated that this is because French forces were the initial enemies of the landing, making for a difficult fit into the war's overall narrative in general histories. The operation was America’s first armed deployment in the Arab world since the Barbary wars and, according to The Economist, laid the foundations for America’s post-war Middle East policy. ^ I sommergibili dell'Asse e l'Operazione Torch. ^ Granito and Emo. Navi militari perdute, Italian Navy Historical Branch, page 61-62. ^ "The Stamford Historical Society Presents: Operation Torch and the Invasion of North Africa"
^ Playfair et al. 2004, pp. 126, 141–42. ^ Smith, Jean Edward (2012). Eisenhower in War and Peace. New York: Random House. pp. 214–15. ISBN 978-0-679-64429-3. ^ a b Peter Mangold, 2012, Britain and the Defeated French: From Occupation to Liberation, 1940–1944, London, I.B.Tauris, p. 159. ^ J. D. Brown, 1968, Carrier Operations in World War II: The Royal Navy, London, Ian Allan, p. 93. ^ Howe 1993, pp. 97, 102. ^ a b Rohwer & Hummelchen 1992 p. 175. ^ Playfair et al. 2004, pp. 146–47, map 19. ^ Playfair et al. 2004, p. 149. ^ Playfair et al. 2004, p. 126, 140–41, map 18. ^ Eisenhower, Dwight. Crusade In Europe, pp. 99–105, 107–10. New York: Doubleday, 1948. ^ a b c R.B.S. (9 November 2017). "Remembering Operation Torch on its 75th anniversary". The Economist. Retrieved 12 November 2017. Meyer, Leo J. (2000) . "Chapter 7: The Decision to Invade North Africa (Torch)". In Kent Roberts Greenfield (ed.). Command Decisions. United States Army Center of Military History. CMH Pub 70-7. Morison, Samuel Eliot (1947). Operations in North African Waters: Vol. II of History of United States Naval Operations in World War II. Boston: Little, Brown and Co. ISBN 0-7858-1303-9. Playfair, Major-General I. S. O.; Molony, Brigadier C. J. C.; Flynn R.N., Captain F. C. & Gleave, Group Captain T. P. (2004) [1st HMSO 1966]. Butler, J. R. M. (ed.). The Mediterranean and Middle East: The Destruction of the Axis Forces in Africa. History of the Second World War United Kingdom Military Series. IV. Uckfield, UK: Naval & Military Press. ISBN 1-84574-068-8.